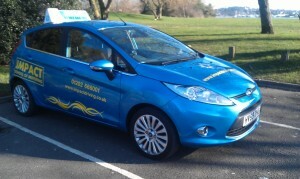 Impact School of Motoring have offered driving lessons in Townsend, Bournemouth for many years. With our extensive experience we would like to give some advice to pupils on how to be safe dealing with one of the most difficult roundabouts in Townsend. Here is an image of part of the cooper dean roundabout near Townsend. I would like to talk about the whole roundabout but the markings on the other side have recently been redone and Google images don’t include this yet. As I can’t afford to buy a helicopter and take the image myself I’ll just talk about this section for now. If you look at the road to the right you will see 4 lanes approaching the roundabouts. Look at the markings, 1 goes left, 2 straight and 1 right. A common error when going straight is drivers will get into the left of the 2 straight ahead lanes and as you look at it this appears to line up with the middle lane around the roundabout, so they go into that one. This would be cutting from one lane to the next, you have to consider that all traffic in the left lane is turning left so as you come onto the roundabout from the left of the 2 straight ahead lanes you will be the left most vehicle of the traffic going around the roundabout so you need to keep across to the left lane. Also beware of the box junction here. This roundabout frequently gets very blocked up and you must only enter the box junction if your exit is clear. Cars come around very fast around the roundabout and you don’t want to be blocking their exit when they do so. We have driving instructors who are able to provide both Manual and Automatic driving lessons in Townsend, Bournemouth. Our driving school is always looking to expand and we are currently looking for more experienced and friendly A.D.I’s to cover Townsend and surrounding areas. Impact School of Motoring have offered driving lessons in Throop, Bournemouth for many years. With our extensive experience we would like to give some advice to pupils on how to be safe dealing with one of the most difficult roundabouts near Throop. This roundabout is opposite castle point. I would like to discuss the route along castle lane from left to right on the image. Start by looking to the far left and you will see there is 2 lanes approaching the roundabout, as you come up this road there is a sign marked through traffic at the side of the road (of course you can’t see it on this image but I mention this because if you are following the main road you are through traffic). This sign shows that as the lanes split to three near the roundabout all through traffic can use either the centre or right lanes. Always use the centre lane unless it is blocked or you are overtaking slow moving traffic. You then have to ensure that the box junction is clear before you proceed. As you go around the roundabout look closely for your lane markings (you can see in the image they are very faded), follow the centre lane and as you come around you then have another box junction to check if it’s clear to proceed. I see more drivers stop in this when their path out is blocked than I have seen stop before it. Mainly because they are coming around the roundabout too fast to react. As you continue around this you should feed to the left of the roundabout whilst checking the pedestrian crossing immediately after the roundabout is clear. A lot to deal with in a short distance so it’s very important to go slowly and carefully around this one. We have driving instructors who are able to provide both Manual and Automatic driving lessons in Throop, Bournemouth. Our driving school is always looking to expand and we are currently looking for more experienced and friendly A.D.I’s to cover Throop and surrounding areas. Impact School of Motoring have offered driving lessons in Winton for many years. With our extensive experience we would like to give some advice to pupils on how to be safe dealing with one of the most difficult junctions in Winton. This is an aerial image of the junction known as “Winton banks” located at the Bournemouth end of Winton high street. First important point to note is check for pedestrians before you move off, many of them try to run across before traffic starts to move. If you are turning right from the high street into Alma road (pictured right), position in line with the arrow so there is enough space for a bus to come passed you in the other direction. The red car in the image is starting to move too far right. If you have to wait, stop at the start of the arrow so your bonnet is in line with the centre of the side road to ensure you don’t overshoot the junction. Also note the box junction to the bottom right of the image, many people think this is to keep the side road clear and disregard a large portion of the box junction as the 2 blue cars have in the image. In actual fact the box junction is there in case a bus stops at the bus stop opposite so traffic has space to overtake the stopped bus without causing a queue and therefore blocking up the crossroads. We have driving instructors who are able to provide both Manual and Automatic driving lessons in Winton, Bournemouth. Our driving school is always looking to expand and we are currently looking for more experienced and friendly A.D.I’s to cover Winton and surrounding areas. Impact School of Motoring have offered driving lessons in Westbourne, Bournemouth for many years. With our extensive experience we would like to give some advice to pupils on how to be safe dealing with one of the most difficult junctions in Westbourne. When dealing with this junction, known as the Liverpool Victoria one way system. Firstly use signs and markings to select your lane early on approach, look well down the road for where your lane leads and stay as central in it as possible. Do not change your lane, even if you find yourself in the wrong one, unless you have thoroughly checked your mirrors and signalled. Beware when heading from the Wessex way towards Poole, the Poole markings will place you in the left lane then move you across traffic to the centre lane half way around the system. You would be best to stay in the centre lane to start with but be aware of other traffic cutting across from your left. We have driving instructors who are able to provide both Manual and Automatic driving lessons in Westbourne, Bournemouth. Our driving school is always looking to expand and we are currently looking for more experienced and friendly A.D.I’s to cover Westbourne and surrounding areas.